Silica makes up about one fifth of the earth’s crust in igneous, metamorphic and sedimentary rocks, however, high purity, commercially available deposits are less frequent. It is generally mined as industrial, foundry or glass sands with its chemical impurities, size distribution and particle shape dictating end use. Industrial sands are mined for use in industrial glass, windows, computer screens, golf courses, foundries, blasting, metal castings, paint fillers, chemical production, prisms, lenses, abrasives, refractories and precision instruments, insulation and precious gems just to name a few. Silica sand deposits are most often surface-mined in open pit operations but dredging and underground mining are also used. For industrial applications, deposits of silica yielding products of at least 95% quartz (SiO2) are preferred. The production of such high purity sand requires that the extracted ore undergo significant processing to reduce impurities through the flotation of gangue minerals such as iron, aluminum and magnesium away from the silica. It is then dried and sized to the optimum particle size distribution depending on application. ArrMaz has several years’ vast experience in silica flotation and provides collectors to many of the major silica flotation operations around the world. We offer custom formulated collectors designed for the various impurities found in sand deposits on all continents. 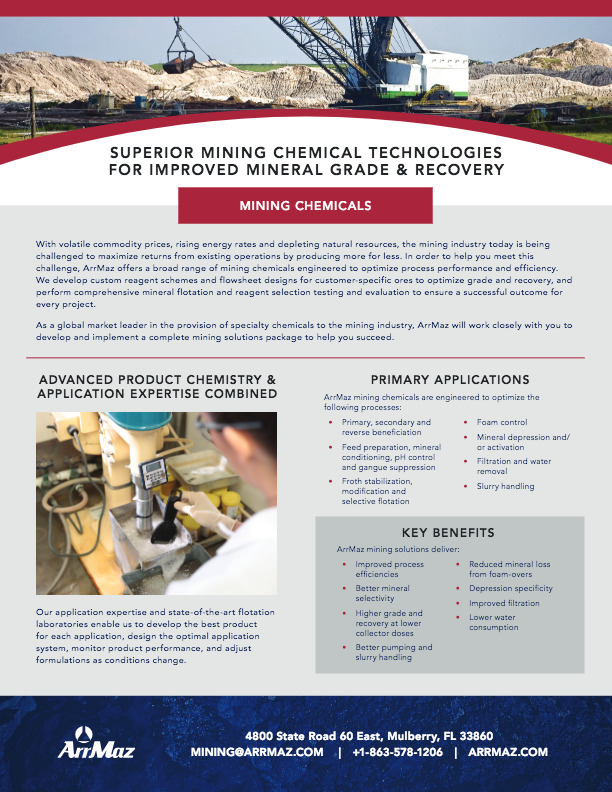 With metallurgical labs and production capabilities around the world, we’re able to conduct specialized testing on your ore to develop the best performing, most cost-effective reagent. ArrMaz is the world leader in reagents developed specifically for mineral processing plants that produce sand of the highest purity for premium electronic applications. We custom blend high-grade cationic and anionic collectors, promoters and frothers for this specific purpose. Whatever your process, ArrMaz can help improve your operation. We have the technical expertise you need and offer process consultation for every type of silica beneficiation process from robust scrubbing operations to the most complex flotation schemes. In many cases, we can design a flotation reagent that floats faster and can simplify your flowsheet. We also help many operations manage their process water quality for improved flotation and environmental considerations.